The meters on this page are not designed to measure ionizing radiation (x-rays, gamma rays etc.) or low-frequency radiation, unless specifically stated. Some EMF meters are single axis: they measure electromagnetic waves coming only from the direction in which you point the meter . So you may need to point it in different directions to see where to get the highest reading. The best meters are 3-axis meters (triaxial). They can measure radiation in all three planes simultaneously, and sum them into a single reading. Some EMF meters are vague about what they are capable of measuring. This is a problem because different radio transmitters use different frequencies, so you need to be sure that your meter can measure those frequencies you are likely to encounter. A range of 100 megahertz to 3.5 gigahertz is fine for most current applications. But in future, some equipment will use higher frequencies, so you may want to consider a meter with an extended range, up to 6 or even 8 gigahertz (i.e. 8000 megahertz). Radio signals can be very brief – they can have gone before you have a chance to note the reading on the meter. So a Peak facility (which records the highest EMF since you started measuring) is useful. Also, an Average facility is helpful, as radiation from most radio equipment can fluctuate rapidly – making reading difficult. Because of these requirements, just about all radio-frequency EMF meters are digital. Amazon Price: $279.99 (as of April 19, 2019 9:59 pm - Details) Product prices and availability are accurate as of the date/time indicated and are subject to change. Any price and availability information displayed on the Amazon site at the time of purchase will apply to the purchase of this product. A handy tool for monitoring radiation in the 50 MHz to 3.5 GHz range, the Extech 480836 RF EMF Strength Meter is ideal for mobile phones, cell phones, base stations, locating RF hotspots, wireless network (Wi-Fi) detection, RF "Electrosmog" detection, and microwave oven leakage. It features non-directional measurement with three-channel (triaxial) measurement probe, maximum hold and average functions, and manual store/recall of up to 99 data sets. The 480836's measurement is optimized for 900 MHz, 1800 MHz and 2.7 GHz. If the RF Measurement exceeds a user selectable threshold, an audible alert will sound. The 480836 measures 9.3 x 2.4 x 2.4 inches (HxWxD), weighs 7 ounces, and is powered by a 9-volt battery. It's backed by a one-year limited warranty. Ideal for EMF measurements of mobile/cell phones, base stations and microwave leakage. This meter has an impressive list of features. It is a 3-axis meter, but you can switch it to single axis to help with directional work. It can display instantaneous, average or peak values in various units of measure. It has a memory which can store up to 99 readings, and an alarm buzzer to warn you when the EMF level exceeds a (programmable) value. It is suitable for most kinds of radio-frequency EMF measurement. Its specified range is from 50 MHz to 3.5 GHz, so I am not sure whether it will detect the super high-frequency digital phones (5.8 GHz) or 5 GHz wi-fi systems. If this is an issue for you, have a look at the Extech 480846. But the Extech 480836 is quite capable of measuring cell phones, cellphone towers, microwave ovens, the usual wi-fi (2.4 GHz), most digital phones (which use from 900 MHz up to 2.4 GHz), as well as almost all other radio and microwave sources. It is the least expensive radio-frequency EMF meter with such a range of capabilities, and mine still gives me good service after several years of EMF survey work. The only problem I have with this meter is that it seems to draw battery power even when switched off, so I always disconnect the battery after use. The Acoustimeter AM-10 has 3 methods of communicating with you: an LCD (screen), a graduated series of LED lights, and an audible sound which mimics the character of the EMF detected. At 7.5 inches long and weighing in at 10 ounces, this is quite a substantial instrument. No case is supplied. The specifications do not indicate whether this is a 3-axis or single axis meter, so it will be single axis. Two Amazon customers commented that it is not very good at picking up extremely brief spikes of energy, such as from smart meters. I am not sure why the manufacturer chose to display peak and average readings in different units of measure (V/m for peak, uW/m2 for average). The claimed frequency range of 200 MHz to 8 GHz is excellent, especially the top end. The main advantage of the Acoustimeter is its user-friendliness, and lack of complicated choices and settings. And the LED lights and sounds make it great for demonstrating the effects of radio-frequency EMF to other people. And this meter is able to detect the new 5 GHz routers and 5.8 GHz cordless phones! Know someone who needs this info? I mean, besides you? Amazon Price: $649.99 $569.00 You save: $80.99 (12%) (as of April 19, 2019 9:59 pm - Details) Product prices and availability are accurate as of the date/time indicated and are subject to change. Any price and availability information displayed on the Amazon site at the time of purchase will apply to the purchase of this product. A handy tool for monitoring frequency radiation in the 10MHz to 8GHz range, the Extech 480846 RF EMF Strength Meter is ideal for mobile phones, cell phones, base stations, locating RF hotspots, wireless network (Wi-Fi) detection, RF "Electrosmog" detection, and microwave oven leakage. High frequency measurement for EMF (10MHz to 8GHz,non-directional (isotropic) measurement with three-channel (triaxial) measurement probe, and manual store/recall up to 99 sets. This RF EMF Strength Meter features non-directional measurements with three-channel (triaxial) measurement probe, maximum hold and average functions, and manual store/recall of up to 99 data sets. The 480846's measurements are optimized for 900MHz, 1800MHz, 2.7GHz, 3.5GHz, and 8GHz. If an RF measurement exceeds a user selectable threshold, an audible alert will sound. 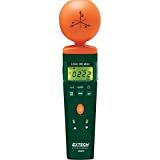 Measuring 9.3 x 2.4 x 2.4" (HxWxD) and weighing 7 ounces, Extech’s 480846 RF EMF Strength Meter comes with a 9V battery, carrying case, and user manual. This is a three axis meter. The claimed frequency range of 10 MHz to 8 GHz (8000 MHz) is excellent, both at the top and bottom end. Features and functionality are similar to that of the Extech 480836, but with an extended frequency range. This guarantees that the meter will be useful for a long time to come, even if future radio transmitting devices make use of higher radio frequencies. There is a very comprehensive and informative Amazon customer review which amounts to a professional review of this meter. This is definitely worth reading if you are seriously thinking of buying it. In view of the price (eye-watering!) you will want to make sure that this is the right instrument for you – before raiding your piggy bank! If you don’t think you will need to detect and measure the new 5 GHz routers and 5.8 GHz cordless phones, you may want to consider buying the 480836 instead, and save a few hundred bucks. Personally I like the 480846 (not for its looks!) and will probably buy it for my EMF survey work when I eventually replace my Extech 480836. This meter will best suit a person who doesn’t mind getting a bit technical, though you don’t need to understand all its capabilities to make basic EMF measurements. Similar product available from Amazon.co.uk – TES-593 Electrosmog RF Microwave Meter up to 8Ghz EMF TES593 . See below. Amazon Price: $397.28 (as of April 19, 2019 9:59 pm - Details) Product prices and availability are accurate as of the date/time indicated and are subject to change. Any price and availability information displayed on the Amazon site at the time of purchase will apply to the purchase of this product. THIS ITEM TAKE 7-10 DAYS TO ARRIVE, do not pay attention to Amazon's time frame, Amazon is not shipping this item. Specifications and appearance of the TES-593 appear similar to the Extech 480846 above. It could be that one is a rebranded version of the other. The specifications are not presented in the same format, so they are hard to compare on a feature by feature basis. However, they are both 3-axis instruments, and both claim a frequency range of 10 MHz to 8 GHz. At the time of writing, the TES-593 is considerably cheaper than the Extech-480846. If they are the same meter, warranty and service issues may play a part in the price difference.